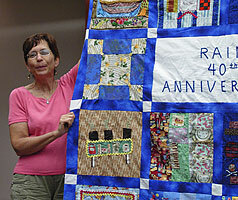 Susan Louis (pictured right) was the guild's Quilter of the Month in October 2004 and October 2010. A member of the guild since 1991, she was also our President from 1995 to 1999. A constant Empire Quilters booster and volunteer for charitable and craft-promoting efforts, this pro also teaches quilting at all levels — in the public schools, at senior organizations, and to folks in the mainstream communities.